Sometimes, even though we spend hours scouring results and rankings, we're a little late to the party. That's the case with Joy McArthur's sudden success in the Hammer Throw. McArthur gave up throwing the shot put and discus this year to focus on the hammer, then burst onto the national scene in May with a 193' 3" mark. 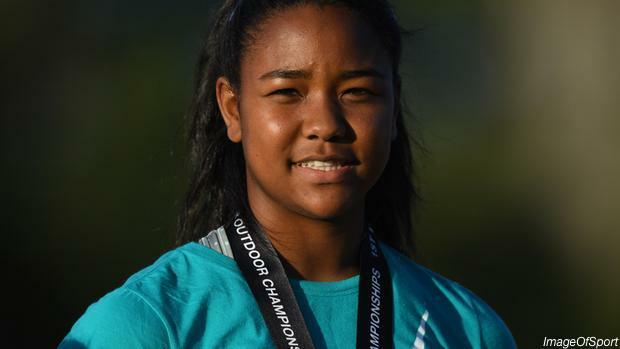 She topped that by throwing 203' 8" at USATF Junior Nationals, earning a spot on Team USA for the U20 World Championship. In the process, she not only leads the nation, but she has also broken the California state record in the event! And we missed it all as it happened. We're sorry, Joy! In our defense, her performances caught even experts in the hammer off guard; High School Hammer writer and event guru Bob Gourley described her as having "literally come out of nowhere to lead the nation." It took me longer to catch on, but now that I'm up to speed I won't miss her performances again!